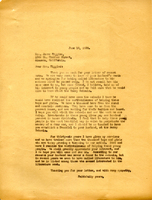 Martha Berry writes to thank Mrs. Higgins for her letter and to give her condolences for the death of Mrs. Higgins' husband. She expresses her wish that Mr. Higgins could have seen Berry Schools, and explains the work of the schools. She then talks about the worthwhileness of helping the children and suggests that helping the children at the Berry Schools would be a beautiful way to memorialize Mr. Higgins. She ends the letter by thanking Mrs. Higgins for her interest and inviting her to come visit the schools. A letter expressing interest in the school and asking if they are all white children. 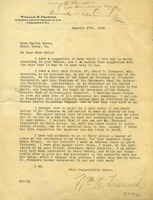 Mr. Trawick writes to Martha with the idea of extending an invitation to Henry Thompson about speaking at Berry, as he is a very influential man and could generate interest in the Berry Schools. 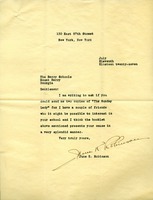 Ethel S. Brown sends a $10 check and wishes it could be much more. 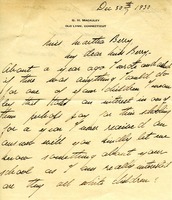 Letter to The Berry Schools form June K. Robinson asking Miss Berry for two copies of The Sunday Lady, a pamphlet outlining Miss Berry's work concerning the Berry Schools, to distribute to two of her friends that might be interested in the work of the schools. In this letter Mrs. C.C. Paige writes Miss Berry to express her interest in the foundation of the school, and request a new pamphlet to replace her old one that had gone missing. Martha Berry thanks Mrs. Fremont-Smith for her $50 gift, her interest in the work at Berry, and for telling others of the work at Berry thereby generating interest. 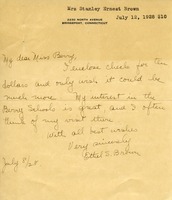 Martha Berry tells Miss Robertson that she appreciates her interest in the Berry Schools and her donations. She explains that a gift of $150 will provide for one student for a year, and that any gift will be appreciated. 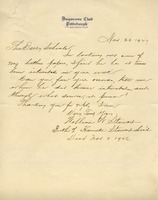 Ruth writes to Martha with interest in the Berry Schools, and asks how she can help in a way besides financial means.